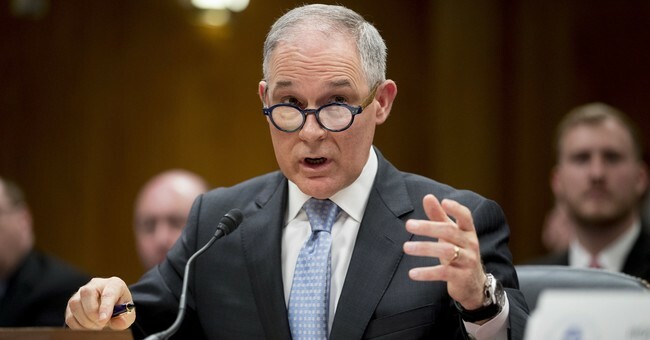 NEW YORK — EPA Administrator Scott Pruitt has been hounded lately by allegations of rich spending and poor judgment. While he could have detonated himself during recent congressional-oversight hearings, the former Oklahoma prosecutor seems to have survived those tests. Nonetheless, EPA’s inspector general, the Government Accountability Office, and various congressional panels continue to probe Pruitt’s official conduct. While Pruitt has plenty for which to answer, on at least three key counts, he seems to be cleaner than his critics claim. • An e-mail sent to the Washington, D.C. office of Senator James Lankford (R - Oklahoma) threatened to assassinate Pruitt, President Trump, and Vice President Pence. • Not content simply to write, one critic showed up in person. An EPA sentry stopped him. “During the confrontation, the subject was able to acquire the security officer’s duty weapon and discharge a round into a nearby chair.” The guard disarmed the visitor, who later was indicted for assaulting a federal officer/employee. These and other concrete provocations justify Pruitt’s focus on security. The Left’s hatred of President Donald J. Trump and his supporters, including Pruitt, is incandescent. One cannot fault Pruitt’s caution, especially after James T. Hodgkinson, a Bernie Sanders campaign volunteer, shot and nearly killed Rep. Steve Scalise (R - Louisiana) and four others at the GOP congressional baseball team’s practice last June in Alexandria, Virginia. A similar attack that maimed or killed Pruitt — and perhaps EPA personnel and innocent bystanders — is hardly fanciful. Such a scenario is worth devoting resources to prevent. Pruitt reportedly requested and was given multiple extensions on his lease until last summer. Having overstayed his welcome, the Harts eventually asked Pruitt to make way for an incoming renter. The Harts changed the locks behind Pruitt. If this couple wanted to curry special favor with the EPA chief, this seems like a rather fruitless strategy. It’s no surprise that these and other actions by Pruitt are under a microscope. For many on the Left, battling so-called “global warming” borders on religion. As they see it, the science is “settled,” this creed is beyond debate, and the heretics who question this faith should be jailed, as Bill Nye the Science Guy has suggested, or executed, as Professor Richard Parncutt of the University of Graz, Austria, has proposed. Someone like Pruitt, who rejects global-warmist alarmism and is powerful enough to implement his ideas (e.g. persuading President Trump to junk Obama’s Clean Power Plan and withdraw America from the Paris Climate Treaty) embodies the Left’s worst nightmares. To the warmists, Pruitt is a torch-bearing arsonist, scurrying maliciously through their Vatican. And he must be stopped. Even if Pruitt winds up scot-free, his situation should serve as a cautionary tale for every member of Team Trump — from the president on down: Their margin of error is thinner than Saran Wrap. President Trump and all who work for him should act as if their every action and utterance were being broadcast live on MSNBC, with Rachel Maddow, Chris Matthews, and Joe Scarborough offering scathing, bitter, and unforgiving commentary. No one on Team Trump ever will get the benefit of the doubt. When the First Lady gets slammed, even for unveiling an anti-cyberbullying initiative, it is safe to assume that everyone in this administration will be scrutinized with the deepest suspicions. As much as these actions by Scott Pruitt can be defended, these days require an even higher level of purity. It may be as physically unobtainable as 250-proof alcohol. Regardless, and unfair as it may be, this must be the ideal to which every member of the Trump Administration, the Republican Congress, and pretty much each American conservative must aspire. Deroy Murdock is a Manhattan-based Fox News Contributor.